Chiaroscuro lighting and distressed surfaces set the tone in Geraldine Alexander’s production of The Crucible. It’s an atmospheric staging, with the set and costumes, care of Jess Curtis, evoking rather than fully rendering the play’s 17th century setting. Arthur Miller’s play is one of suffocating claustrophobia and the design and direction maintain that, using focused stage movement and shafts of light through high windows to heighten things further. When the great barn doors of the set open, revealing the forest beyond, it further reinforces the sense of entrapment that pervades Salem. Alexander’s research brought to light links with Beverley in Yorkshire’s East Riding. This led her to pitch the text in a northern dialect. This makes the piece feel at home played in the north of England, while still retaining the Massachusetts setting. There are some standout performances among the large cast. Matthew Flynn is an imposing and muscular John Proctor, manipulated guilefully by Eleanor Sutton’s icy, strong-willed Abigail. 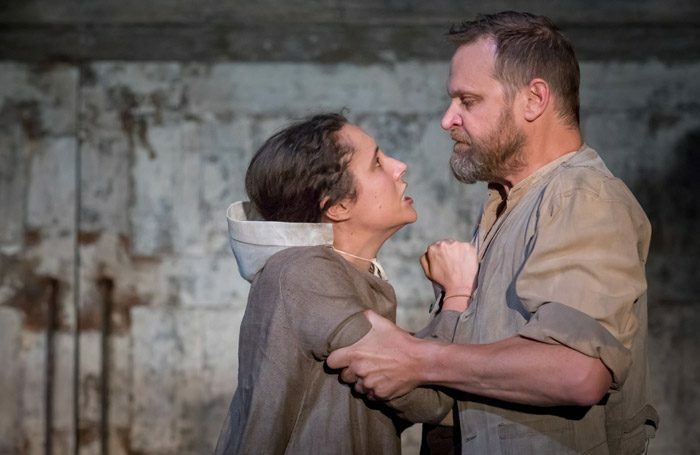 Martin Turner’s disturbingly Machiavellian deputy governor Danforth spars with Freddy Elletson’s zealous Reverend Hale, and Leigh Quinn is quite extraordinary as the beleaguered Mary Warren, whose recanted testimony becomes the final catalyst to catastrophe. This strong ensemble work, along with Simon Slater’s impressive sound design, serve to rack up the tension, building to a searing courtroom climax, culminating in a display of terrifying hysteria. The shattering stillness in the auditorium throughout the desperately tragic closing scene is testament to the production’s power.